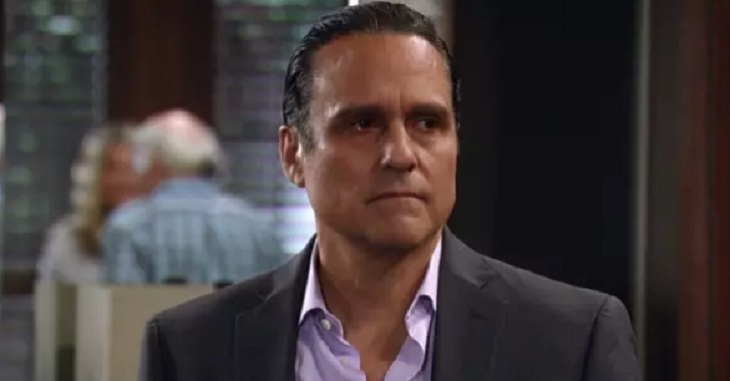 General Hospital spoilers tease that Sonny Corinthos (Maurice Benard) will share his concerns about their daughter Kristina Corinthos-Davis (Lexi Ainsworth) with Alexis Davis (Nancy Lee Grahn) in the coming week. Jason Morgan (Steve Burton), Damian Spinelli (Bradford Anderson), and Alexis’ oldest daughter Sam McCall (Kelly Monaco) have been running a sting and investigating Shiloh Archer (Coby Ryan McLaughlin) and Dawn of Day. Among other irons Sonny has in the fire such as trying to find oldest son Dante Falconeri (Dominic Zamprogna) and protect daughter-in-law Lulu Falconeri (Emme Rylan) and close friend Laura Webber (Genie Francis), Jason will undoubtedly be reporting back to Sonny about anything concerning Kristina and possible dangers within the cult! General Hospital spoilers show Alexis has already been to a seminar at Kristina’s urging, and although she decided it “wasn’t for her” she did see that Kristina seemed to be getting some good out of the self-help techniques of Shiloh and his teachings. However, she’s only seen the surface of the cult; the good parts that they want people to see to draw them in! Sam and Jason, however, sense a very dangerous place behind the scenes and suspect mind control and other unsavory practices may be behind the peaceful, loving and kind place they publicize themselves as. When Sonny hears what Kristina has possibly gotten herself into, you can bet he’ll be on it and warning Alexis not to fall for the Dawn of Day’s false front! Even though Spinelli was able to verify Shiloh’s past of being a contractor in Afghanistan, he could not verify any contact with Drew Cain (Billy Miller), but then Drew was a Navy Seal, and much of his time in Afghanistan may have involved secret missions. Of course, he doesn’t remember his and Shiloh’s history either, and Kim Nero (Tamara Braun) wasn’t any help because they went their separate ways when he was deployed! Stay tuned to GH and keep checking General Hospital spoilers frequently to see the exciting developments and drama in the Dawn of Day cult story and others, as we head into February sweeps!